I tend to always have some sort of beverage with me at all times, and more often than not that beverage winds up being something that either by design or my sheer wimpiness requires the help of a bottle opener to open. So, when the opportunity to review Openacase came, I was pretty excited about the prospect. What’s Openacase? 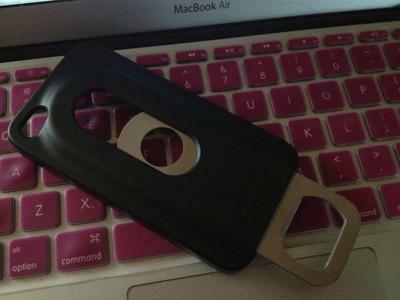 Openacase is essentially a hard plastic case for your iPhone that has a slide-out bottle opener built in. The case started out as a Kickstarter project, that managed to get fully funded and turned into a reality. While the cases were technically “on sale” for investors to the Kickstarter project, they just recently went on sale to be purchased the traditional way. How does it work? Openacase works in just the way it looks it might. 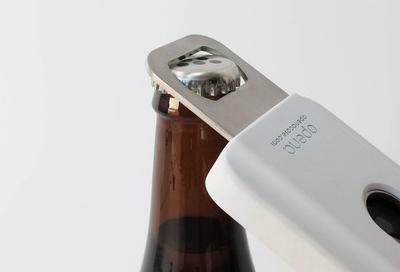 A metal bottle opener slides out from within the case, and uses your phone as a brace to open bottles. I tried the case out on a variety of different bottles and was able to eventually open all of them. One issue I had with my particular case was that the opener often failed to lock in place when pulled out of the case (or the lock wasn’t sturdy enough to hold it). What that meant was that sometimes I would try and open troublesome bottles, and would end up shoving the bottle opener back into the case instead. Another concern I have is with the placement of the opener itself. The bottle opener comes out from the back of your phone, but is designed so that you use it with your screen facing downward. What this means is you’re essentially opening our beverage into the inner workings of your phone. In general that’s okay, but if you end up opening an over-excited soda (or other beverage), then you could wind up soaking the inside of your phone pretty quickly. Worth buying? I depends on how often you’re opening bottles and how badly you want to impress your friends. The case adds quite a bit of bulk to your iPhone (so much so that I often confused myself into thinking I had a backup battery connected to the phone) which isn’t really worth it for a feature may only use once every now and then. If you’re opening bottles pretty often, however, having an opener built in to your phone can be exceptionally helpful. Each time I pulled the case out I also attracted a crowd of interested onlookers, so it’s also a pretty solid way to impress your friends and perhaps make a few new ones. Gotta have one? Openacase is available now from the company’s website for $39.95 in both black and white.